Trumpet, Baritone T.C.. Composed by John Kinyon and John O'Reilly. Concert Band Method; Band Supplement. Yamaha Band Method. Intermediate level piece for the Piano Quartet event with the National Federation of Music Clubs (NFMC) Festivals Bulletin 2008-2009-2010. Book. 24 pages. Alfred Music #00-5260. Published by Alfred Music (AP.5260). 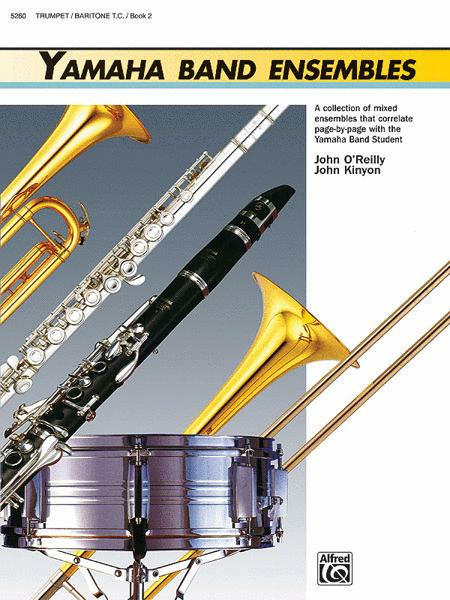 Yamaha Band Ensembles provide interesting repertoire selections in an amazingly flexibly format that will meet the needs of your band year after year, regardless of how your group's instrumentation varies. Each piece can be performed as a solo or ensemble by any combination of same or mixed instruments. Each ensemble also correlates with a specific page in the Yamaha Band Student.